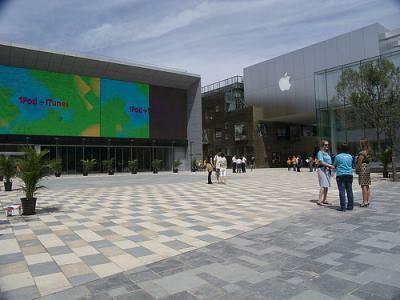 On July 19th, Apple is opening its first retail store in China in Beijing's Sanlitun entertainment district. The store opens at 10 a.m. local time. "This is the first of many stores we will open in China," said Ron Johnson, Apple's senior vice president of retail, in remarks at the store. He later added that Apple will open stores "in Beijing, in Shanghai and beyond," and confirmed that another store will open in Beijing's Qianmen area, a shopping street south of Tiananmen Square that has been renovated ahead of the Olympic Games, which begin next month. The store carries the same design as Apple's other retail stores but with a multilingual Genius bar. Since Apple has not yet negotiated a distribution deal with Chinese carriers, the iPhone will not be available initially. Apple's presence in China was reportedly minimal before the iPod's introduction about 5 years ago, but Apple appears to be continuing to expand their international retail push. This will be their 219th retail store worldwide. The Wall Street Journal's China Journal provides photos from the new store.